Old Testament - Bible.org's commentary on Exodus Chapter 35 is at this link. Bible.org's commentary on Exodus Chapter 36 is at this link. New Testament - Today in Matthew 27 verse 32 we read - "As they were on the way, they came across a man named Simon, who was from Cyrene, and they forced him to carry Jesus' cross...."
Verses 37 & 38 - "A signboard was fastened to the cross above Jesus' head, announcing the charge against him. It read: "This is Jesus, the King of the Jews." 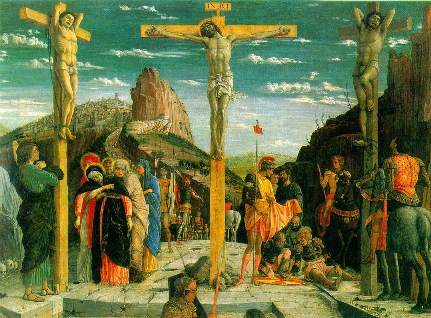 Two criminals were crucified with him, their crosses on either side of his...."
Verse 51 is significant - "50Then Jesus shouted out again, and he gave up his spirit. 51At that moment the curtain in the Temple was torn in two, from top to bottom." The curtain separating the Most Holy Place was torn in two at Jesus' death, symbolizing that the barrier between God and humanity was removed. Now all people are free to approach God because of Jesus' sacrifice for our sins. Hebrews chapter 10 verses 19 & 20 puts it this way - "And so, dear brothers and sisters, we can boldly enter heaven's Most Holy Place because of the blood of Jesus. This is the new, life-giving way that Christ has opened up for us through the sacred curtain, by means of his death for us." Verses 57 through 60 - "As evening approached, Joseph, a rich man from Arimathea who was one of Jesus' followers, went to Pilate and asked for Jesus' body. And Pilate issued an order to release it to him. Joseph took the body and wrapped it in a long linen cloth. He placed it in his own new tomb, which had been carved out of the rock...."
Psalms - Psalm 34 verse 9 in the NIV reads- "Fear the LORD , you his saints, for those who fear him lack nothing." What does fearing God mean to you? Check out Bible.org's commentary on Psalm 34 entitled "The Fear of the Lord" at this link. I just want to say how much this one year bible experience means to me. Thank you Mike for all the insights and time you put into this. Also if I may ask for a prayer request from all you prayer warriors out there. My best friend Vanessa is in the fight of her life right now. she has been battling cancer for 10 years now. It is in her lungs, bones & liver now, she is in a lot of pain and facing weekly strong chemo treatments. She is a believer please pray that God would be with her and give her peace and heal her body. She is a fighter and not ready to give up yet. I hope Mike that you don't mind me making this request on your sight. All I can think of is this, “God’s work done God’s way will never lack God’s supply. Moses calls the people to bring an offering giving them a list of things that are needed. And low and behold with no arm twisting, no manipulation, and no “we’re going under if you don’t help” appeals, the people give. 20 So all the people left Moses and went to their tents to prepare their gifts. 21 If their hearts were stirred and they desired to do so, they brought to the LORD their offerings of materials for the Tabernacle and its furnishings and for the holy garments. 22 Both men and women came, all whose hearts were willing. Some brought to the LORD their offerings of gold--medallions, earrings, rings from their fingers, and necklaces. They presented gold objects of every kind to the LORD. “If their hearts were stirred …” What does it take to get people “stirred” to give? I believe, and this is only my belief it is not based on biblical evidence, at least not yet, that when we do things the way God tells us to do, the people assigned to help us will come flocking to our side. When that happens you get an over abundance because we serve a God that is more than enough! 4 But finally the craftsmen left their work to meet with Moses. 5 "We have more than enough materials on hand now to complete the job the LORD has given us to do!" they exclaimed. How many church leaders would love to be able to get on the platform and call a halt to receiving offerings much less accepting them? It also takes men and woman of integrity to not take more than what is needed and pocket the rest or start a program what we were not called to do. These verses are a model for a church’s or ministries fiduciary trust. If what is brought in an laid at leadership’s feet for the work of the ministry exceeds the “vision” or “call” that was given the visionary, then the offering, not the tithe which is mandated, should be shut down. 7 Let each one [give] as he has made up his own mind and purposed in his heart, not reluctantly or sorrowfully or under compulsion, for God loves (He takes pleasure in, prizes above other things, and is unwilling to abandon or to do without) a cheerful (joyous, "prompt to do it") giver [whose heart is in his giving]. 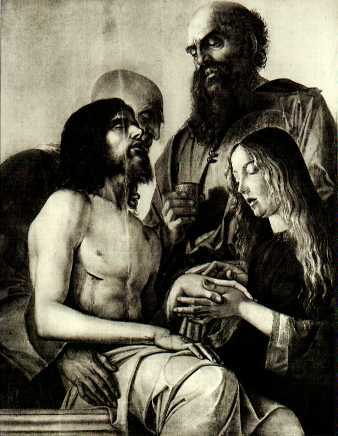 The picture of two groups of followers of Jesus fascinates me; well really it’s one man, Joseph, of Arimathea and the woman who followed Jesus, as well as his disciples. In this text as well as in the other Gospel’s it mentions that those who had followed closely, those who had provided monetarily as well as for the comfort of Jesus, now followed from a far off, at a distance. While a man, who we first hear about in this passage, with boldness, went to Pilate in front of the Roman governmental officials, as well as those who hated Jesus and asked, in the open, for Jesus’ body burying him in the open. The text states that this man was a follower of Jesus. Had he been an undercover believer, like a secret agent, or had he been open with his belief risking his life? There was and is a documentary of the history of the Jews or Hebrews up until the beginning of the First Century called, The Kingdom of David. This is one of the best and least biased, my opinion, of the history of the Jews that I’ve seen. It was originally produced for Public Television and it tells the history of and the political intrigue that went on from the time of Abraham up till the Apostle Paul. This is not apiece about religious beliefs but is told from an historical perspective. During the time Jesus walked the earth there was so much animosity between the differing Jewish parties, Sadducees, Pharisees, Zealots, as well as within each party that assassinations had become a way of life as well as an art form. Didn’t like the agenda that someone had, take them out permanently. Upon watching this series, I was in total awe of Jesus’ ability to “Walk through the crowd” and escape the attempts by the religious leaders to kill him. They couldn’t do it because it was not in God’s timing as He had to go to the cross. The other thing in this passage that we can become too comfortable with is the assumption that we are not the faces in the crowd of “mockers” that passed by while Jesus hung on the cross. Jesus had been given a triumphant greeting as he entered Jerusalem just one week before. But the crowd was expecting Jesus to overthrow the Roman government and free them for an oppressive regime. They expected Jesus to give them back control of their city and temple. Remember a non-Jew had built the temple, Herald the Great, to gain favor with the Jews so he could control them, he thought. The Middle East was a very volatile part of the Roman Empire, just as it is today, and the main function of the ruler or governor was to keep the peace in Jerusalem and its surrounding environs. Jesus’ Kingdom was not the kingdom they neither expected nor wanted so the cries of Hosanna, “Save Us” turned to “Crucify Him” when they saw that their dreams would not come true. God’s plan and God’s way had not become theirs. How many of us follow Jesus for what we want and when we don’t get it we try to manipulate those around us to get what we want. How many walk away from the church because we become disappointed and disillusioned because we really don’t want to be released from “sin” we just want to be released from its consequences? “God just give us what we want not what we need.” When we pick up that cry, either spoken in words or spoken in behavior, we become the mockers in the crowd, 40 "So! You can destroy the Temple and build it again in three days, can you? Well then, if you are the Son of God, save yourself and come down from the cross!" Thank God that He is so merciful when we become stiff necked and shake our little impotent fists at Him. If we got what we wanted we would still be missing what we needed so we would go after what we needed in spit having what we want. 12 There is a way that seems right to a man, but in the end it leads to death. Our cry is this, “Give me what I want …even if it kills me,” thank God for His Mercy. he saved him (her) out of all his troubles. God lifted me out of the muck and mire, out of the snake pit of the consequences of my own choices and set my feet on the Solid Ground of His Truth. This Blog calls all to, 8Taste and see that the LORD is good; blessed is the man who takes refuge in him. Sometimes we just need to keep our mouth’s shut or at least discern who we are advising, counseling, etc. These verses state that in short if we rebuke a mocker we are wasting our breath and setting ourselves up for injury. Probably this injury could be either physical or emotional. Yet the wise man will accept a rebuke. The question we have to ask is how do we tell is someone is a mocker or a wise man? Hmmm A fool or a mocker never presents themselves as a fool or mocker they always present themselves as wise, knowing everything. This expereince is changed my life in so many ways. I feel empty inside when I do not have my time with the Lord. I yearn to read each verse and mediate on them during the day. The bible I am reading is the Every Man's Bible. Every man should read this bible because the comments apply to the men of today. God bless everyone on this marvelous journey.